Little House Home Arts: Talk about Batting! Which batting to use? Perhaps too many choices? Talk about batting! For those who thought baseball think again...That is not the only sport that has "batting practice". 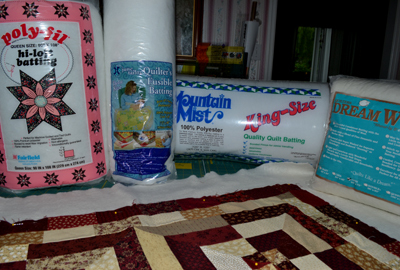 I am choosing batting for my various quilting projects and am finding it is no small decision. Years ago my mom and I used to always go with polyester batting, thin or high loft. We used the thin for hand-quilting and the high loft for tied comforters. They were warm and fluffy and very light-weight and laundered beautifully. Our favorite battings were sized or bonded on both sides, keeping the fibers together as they rolled out evenly, stayed together and did not bunch when washed and dried, no matter how much quilting or tying joined the top, backing, and batting together, or what is now referred to as the quilt sandwich. Now the choices are more numerous: 100% cotton in different lofts (thicknesses); cotton/poly blends with different percentages of each as well as different lofts; recycled plastic bottles which sounds crazy but is very soft and reports little shrinkage (and whether we realize it or not, is likely just a polyester made of recyclables, helping the environment); bamboo, or blends of bamboo, silk, cotton and botanic Tencel in a variety of lofts; and last but not least wool. Sometimes different colors of battings can even be found. The usual colors are white, off-white, black or light green. 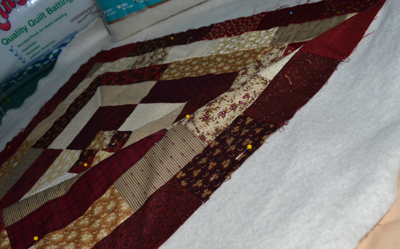 Fusible battings are even a possibility so that the batting can't shift as you are quilting it. The brands and costs vary according to organic and non-organic fillings. Of course, some people still use a blanket between the top and backing for their quilts, just as they did many years ago. I have chosen a cotton batting to use for my wall hangings, just in case they fall into hands that might want to wash them and give a slight press to them. Polyester will flatten when pressed, and I am hoping that cotton will retain its loft a bit better, in case a light press is used. 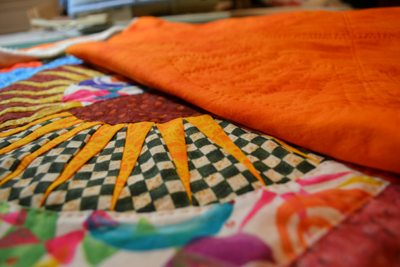 There is no fear that my quilts will ever see an iron after washing!! Cotton does shrink and as I am still old-fashioned and preshrink my materials to assure me that they are not only pre-shrunk, but colorfast as well, I am going to go with a batting that advertises itself as one that requires no need for pre-shrinking. My plan is to record what I use and how it quilts under different conditions, conducting my own quilting experiments, if you will. Everyone has their own preferences and this is how I will determine mine. Initially I will be using the same batting for all three of my small quilts/wall-hangings. Purchasing one large queen-sized batting to do all three is less expensive than buying a separate batting for each. 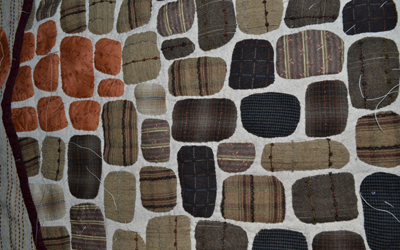 I chose a low loft, almost felted-sort-of cotton batting that can be used for either machine or hand-quilting. 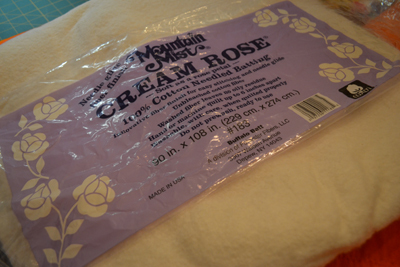 I am using Mountain Mist as that is the brand I used to use in my earlier days of quilting and feel it is a good omen that they are still making battings. My first wall-hanging is done with only one thickness of this batting and is a nice weight to practice my hand-quilting stitches. 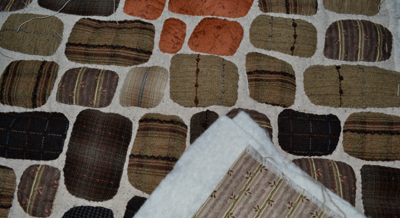 A single layer of "felted" cotton batting is thin, making hand-quilting easy. Simple quilting next to seams makes my quilting design easy and effective. I am using two layers for my appliqued wall-hanging to get more dimension, though my hand-quilted stitches are not quite as close together as my first project, due to the thickness of the two battings used together, though I really like that it gives an almost trapunto sort-of-puff to my design. 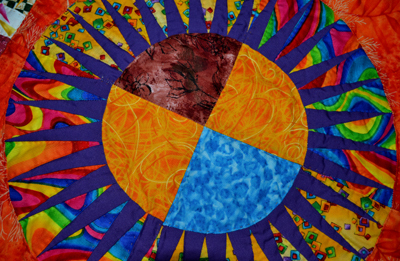 It is fun to see how my hand-quilting adds dimension to this piece. I am using two layers of felted cotton batting. Not the easiest to hand-quilt. I am getting what I hoped for, a trapunto-sort of effect. I plan to machine quilt my third small quilt using only one thickness, and it is really nice that I still have large pieces of batting left over that will likely be enough for another small quilt or wall-hanging when I am finished with these three. 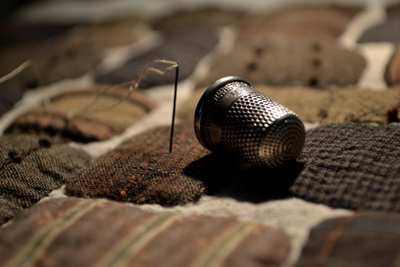 I learned when I first started quilting that left-over pieces of batting can be stitched together as long as the type of batting, and loft are the same. 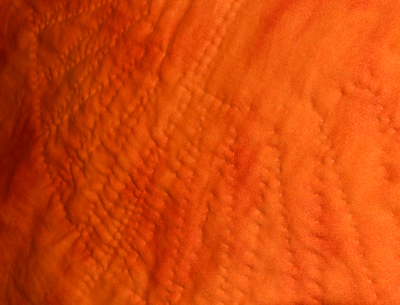 Just push the edges of the batting together and then hand-baste them using a large z-patterned back- stitch, from one piece of batting to the other. I like to do it on both sides to be sure that it doesn't pull apart. When quilted you won't have a clue that the batting was pieced. 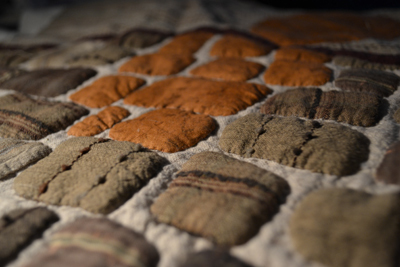 This piece has one layer of "felted" cotton batting to machine quilt. So when choosing your batting consider your options and decide which batting will best suit your needs in terms of type, thickness or loft, size you will need and the amount of stitching required to keep the batting stable and secure. If you are like me and are uncertain, either consult your local quilt store expert, or make more than one quilt and try different ones. I think that when I am done, I may consider making small unfinished sample quilt sandwiches, labeling the brand and loft of the batting to refer to in the future. I love "hands-on" samples when making my decisions. Different battings suit different needs and a little practice does make perfect! Labels: quilt batting choices; hand quilting; machine quilting; applique; trapunto-like effect; thick warm tied comforters.